LUX: What role does Paris play in your creative inspiration? Ramesh Nair: Paris is the city I have lived in the longest at a single stretch and I still find it amazing, creatively speaking. Inspiration comes from many things big and small – simply living here, walking the streets, observing the buildings and the people. The juxtaposition of the old and the new, the quality of the light and the depth of the sky, the architecture (always look upwards while walking through the city). And the unmistakable Parisian style. Paris is a unique city where the past is always with us even as we live modern lives. For me, this is perfectly captured by I.M. Pei’s pyramid for the Louvre with its Cubist inspiration and its determinedly modern use of materials like steel and glass, the perfect counter-balance to the classical architecture of the Louvre itself. This is the ideal I hold in my mind when I create modern bags or trunks for Moynat: to strike an equilibrium between heritage and modernity, between traditional craftsmanship and contemporary design. LUX: What’s your favourite part of the city? Ramesh Nair: Each district in Paris has its own unique personality and flavour. On the left bank, I have a soft spot for the Beaux Arts neighbourhood. Across the river from the Louvre, this is a warren of old streets steeped in history. The profusion of art galleries, specialised boutiques with unusual products, and the presence of the Beaux Arts school helps keep the neighbourhood youthful and avant-garde. The hotel where Oscar Wilde spent his last days is located here, too. On the right bank, I like the area from Trinité to the Montmartre neighbourhoods. I like the mix of art galleries and artists’ studios, theatres and cabarets, small-scale industries like printers, right next to open-air markets. The Théâtre Réjane was set up in this neighbourhood in 1906 and still functions under the name Petit Théâtre de Paris. There is some remarkable modern architecture to discover, including Adolf Loos’s house for Tristan Tzara. LUX: Ever feel the urge to reconnect with nature, away from the big city? Ramesh Nair: When I have the time, I prefer to drive out of town in search of greenery. Every year, I take a few weeks to explore different parts of France, to discover the diversity of natural beauty in this country, not to mention the wines of the different regions or terroirs. LUX: Your inside track on Parisian cuisine? Ramesh Nair: Since I am vegetarian, I often have to ask restaurants to accommodate my choice and I have had some lovely surprises. One of my favourite places in Paris is La Bauhinia at the Shangri-la where chef Christophe Moret impressed me not just with the quality of his organic, locally sourced vegetarian ingredients, but also with the way he elaborates his choices, and of course the exquisite cocktails. I am also very pleased that so many great chefs are embracing the idea of vegetarian cuisine, from Alain Ducasse at the Plaza Athénée to Thierry Marx at his restaurant Camelia in the Mandarin Oriental. For me, the fusion of different types of cuisine is really the wave of the future, but it has to be done with a lot of respect for the culinary traditions of each culture. I think chef Atsushi Tanaka has elevated this to an art form at his restaurant AT. LUX: Is eating out all about the cuisine? Ramesh Nair: Not at all, I am very sensitive to the authenticity of any experience. From a very simple, home-style environment to a Michelin-star restaurant, truthfulness to one’s vision and passion will always make itself felt. Apart from the ambiance and music, the quality of the service, the contact between guests and staff, the effort made to share what the experience is all about, these are elements that feed all the senses. LUX: What’s your cultural life in Paris? Ramesh Nair: My two great loves are art and music. I try and catch as many concerts as possible (blues, jazz, rock…) when work allows me. I like the acoustics of the Olympia and the Grand Rex. Smaller venues like New Morning and La Maroquinerie are great if you want a more intimate setting or to discover rising stars, plus great acoustic quality. Paris has so many art museums and galleries that it is hard to pick even a few… plus the museums are often breathtaking on their own. At the moment there are two simultaneous exhibitions showcasing the oeuvre of Martin Margiela, whom I had the privilege of working with during my early years in Paris. LUX: Where does a Parisian designer like you shop for clothes? Ramesh Nair: Mostly at Yohji Yamamoto for clothes. I am obsessed with trainers, of which I have a collection of limited editions and rare models. LUX: You travel a lot on work, what is the first thing you do when you get home? Ramesh Nair: Relaxing with my cat is the perfect antidote for jet lag. LUX: What would you recommend all visitors to Paris to do? Ramesh Nair: Paris is a city meant to be explored on foot. So, walk along the Seine, explore the Ile Saint-Louis with its historic buildings and bridges. If you walk through the Louvre courtyard at night, you can see the art through the windows and it gives you a whole new perspective. LUX: London was the first city outside of Paris to have a Moynat store – why was that? 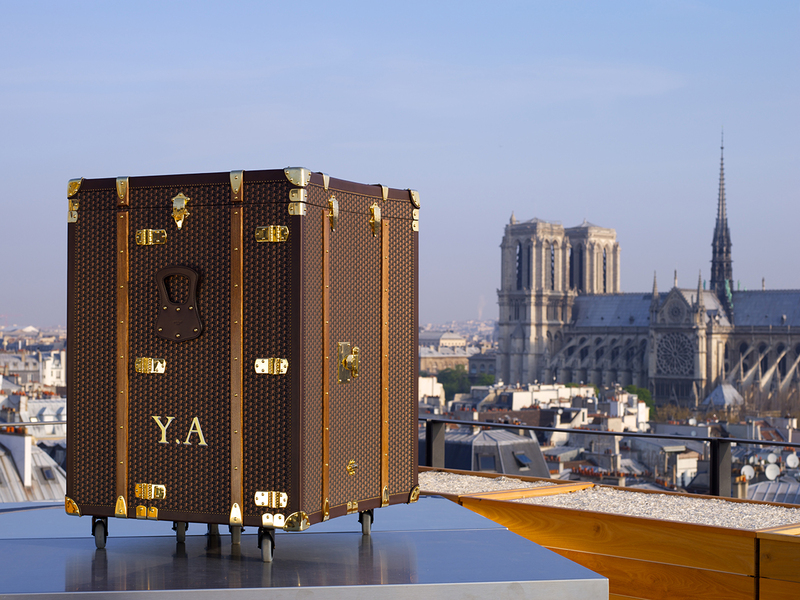 Ramesh Nair: Moynat has had historic ties with London since the very founding of the House. In the mid-1800s, radical advances in the way people travelled and experienced the world made it possible for houses like Moynat to reach visitors from the UK and to make their innovations and quality known. This was one of the keys to the reputation and success of Moynat. So it was a natural decision for us to make London our first store outside of Paris. The Mount Street store is one of my favourites, for its architecture, its luminosity and its distinctive character. We will soon have a second store on the ground floor of Selfridges, which will showcase our House in a different environment and to a different type of customer.